Butser Rubber is a supplier and manufacturer of custom rubber washers and square section seals for an extensive range of industries including but not limited to Automotive, Aerospace, Marine and Agriculture. We use automated machinery to manufacture your rubber washers and square section seals to the industry standards. This allows us to provide documentation to PPAP Level 3 in addition to Certificates of Conformity. We have experience manufacturing washers with splines and shaped washers using materials including EPDM, Silicone and Sponge. We also specialise in adhesive backed washers in a range of 3M, Acrylic and Commercial grades. We can manufacture these in almost any material. Please refer to our materials page. Butser Rubber have a history exceeding 40 years in the production of high quality custom rubber washers and square section seals. We invested wisely in state-of-the-art, automated machinery in order to meet the requirements of customers. We can manufacture washers and square section seals in almost any material from our range of over 350 rubbers and silicones. 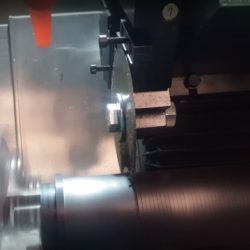 In addition, we can apply an adhesive back to materials for a competitive cost allowing flexible use of the your bespoke rubber washer or square section seal. 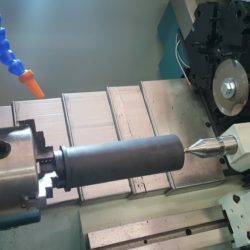 Using our extensive range of automated rubber washer and square section seal machinery, we can mass produce as well as prototype parts to your specification. We offer a bespoke service from start to finish by offering customers our existing knowledge in the production of rubber components to lower price and meet your project requirements. If you would like more information regarding our production capabilities, please get in contact with our team. 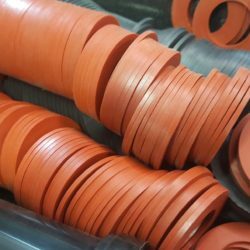 Using our expertise as a manufacturer and supplier of bespoke rubber washers and square section seals we can offer a wide range of materials to choose from. We have a range of over 350 ‘off the shelf’ materials to choose from including high temperature resistant, oil resistant and fuel resistant rubbers. If you require a more specialist material we can accommodate your requirements to produce a material that meets your specification.